Google, Facebook, and three other companies (here, here, here, here, and here) are gearing up to provide high-speed global WiFi coverage from space within the next three to four years. This would be an ecological and public health nightmare, according to a recently-formed international coalition: the Global Union Against Radiation Deployment from Space (GUARDS). As the national conversation ensues concerning vaccination, health rights researcher and advocate Catherine J. Frompovich is this week’s guest on Real Politik. A frequent contributor to ActivistPost, Frompovich discusses the steadfast pharmaceutical corporate and regulatory agenda moving toward mandatory vaccination policies in the US. Catherine has been a consumer healthcare researcher for 35 years. She is a retired natural nutritionist with advanced degrees in Nutrition and Holistic Health Sciences, Certification in Orthomolecular Theory and Practice, in addition to Paralegal Studies. Catherine has authored numerous books on health issues, along with co-authoring papers and monographs with physicians, nurses, and holistic healthcare professionals. 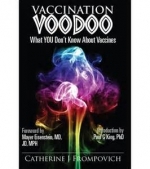 Her latest book is Vaccination Voodoo: What YOU Don’t Know About Vaccines. The processed food industry is seeking to turn back the global movement toward organic and non-GMO food by promoting its often unwholesome products as healthful and nutritious. In mid-March the Associated Press released a detailed report on how Coca-Cola commissioned fitness and nutrition “experts” to promote its high-fructose corn syrup-laden soft drinks as part of a healthy diet. Ivy League powerhouse removes position statement on wireless safety from website after letter writing campaign by concerned parents. Princeton University administrators removed its position statement on wireless safety from their website after concerns were raised that Princeton’s information was “outdated and inaccurate”. Starting in early 2014, a parent, Thea Scarato, wrote the radiation safety officer detailing point by point why Princeton’s website needed to be updated to accurately reflect the state of science on health risks from wireless radiation. By August of 2014, Princeton had pulled down all information related to wireless radiation. On this edition of Real Politik James speaks with Southern California-based independent researcher Sofia Smallstorm. She has written extensively on hidden agendas and complex events since her controversial work on 9/11. In the process of researching that topic, she discovered the phenomenon of artificial clouds, geoengineering, or “chemtrails.” From this Smallstorm came to acknowledge the presence of a synthetic biology agenda in the activities that constitute everyday life.